Bangkok – 30 August, 2018 – Edward Kopp, Country President of Chubb Samaggi Pcl. 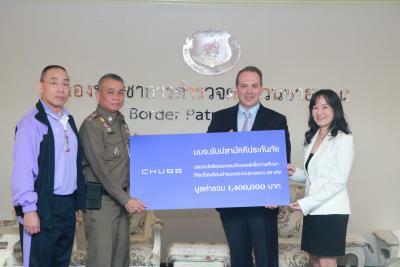 presented the donation to Police Lieutenant General Prapun Chantaim, Commissioner of Border Patrol Police Bureau. With the aim to sustain its ongoing commitment towards furthering education for children living in some of the country’s poorest areas, Chubb donated learning materials and reading books as well as computers, totalling BHT 1.4 million to 28 Border Patrol Police Schools. Besides the donation, Chubb also recently organized practical training to instruct the teachers on how to use storybooks that integrate 8 learning areas to achieve the greatest educational benefit. This special training was held at Phra Phuttha Yodfa Camp in Kanchanaburi and at Somdet Kromphraya Damrong Rachanuphap Military Camp in Ubon Ratchathani. Over 100 teachers from 28 Border Patrol Police schools had participated in training class. The company’s market leadership position is largely attributed to its strong partnerships with financial institutions as well as leading companies, the clients and employees of which benefit from tailored protection policies.